This past weekend, Mark Ruffalo found the video made about our Bike Blender, and shared it on his Tumblr, saying: “This is a brilliant project by Dickinson College students. Can I put in an advanced order for a blueberry smoothie in May? ?” Of course you can, Mark Ruffalo! To see the post, click here! What do you do when the multiple feet of snow leave your bike path useless? A group of people in Boston decided to take matters into their own hands by digging a tunnel through a 15 ft high pile of snow that was blocking their frequently-used path. Read more here. Just because it’s cold and snowy outside doesn’t mean that everyone packs away their bikes. Some people find the snow and ice to add some extra adventure to their ride! Dickinson has partnered with Cole’s Bicycles, a local, family-owned bicycle shop to offer great deals to Dickinsonians on bikes, locks and accessories. Dickinsonians get a discount at Cole’s and receive great deals all year! Reach out to biking@dickinson.edu with questions. Join us in #dsonbiking adventures. Like, follow and friend us to get the latest info! 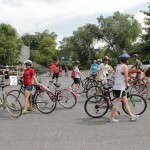 Check out current events and The Handlebar hours for Biking@Dickinson programs on our calendar!